In the third walkout of its kind in five weeks, workers across the city are demanding a living wage of $15 per hour and the right to form a union without retaliation. Fast food and retail workers in St. Louis, Missouri, walked off the job Wednesday in the third major strike of its kind in recent weeks. The walkout came after a citywide fast food and retail workers strike in New York on April 4th and another in Chicago on April 24. 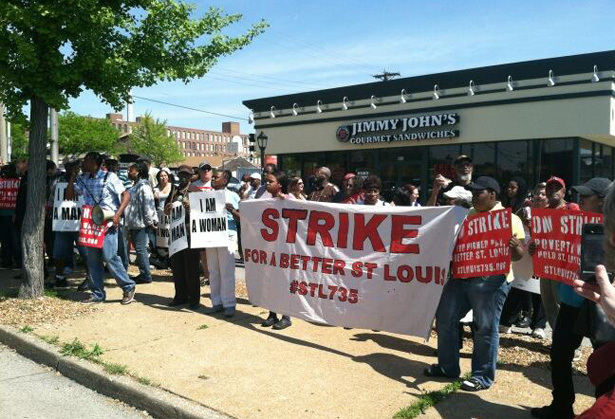 Workers at Jimmy John’s in the Soulard neighborhood were the first to walk out in a surprise strike, and employees at a McDonald’s in north county followed Wednesday evening. Organizers anticipated that workers at at least thirty restaurants, including Wendy’s, Hardee’s and Domino’s, would join in additional walkouts on Thursday. Like strikers in New York and Chicago, the St. Louis workers are calling for a living wage of $15 an hour and the right to form a union without retaliation. The current hourly minimum wage in Missouri is $7.35. Angela Harrison, a McDonald’s employee striking on Wednesday, echoed that sentiment. “We want respect, and we want fifteen and a union, and that’s not too much to ask for.” She said that even workers who had been physically hurt on the job or burned by equipment were not treated properly. “We want simple things, like the first-aid kit to be fully stocked all the time.” Harrison also pointed to the lack of sick days as an issue she’d like to see resolved. Right now she has to choose between coming to work sick, putting customers at risk or missing out on pay. Harrison had never participated in a strike before Wednesday, and said that it was knowing there was so much community support behind the strikers that helped her make the decision to walk out. Organizers have committed to helping workers get their jobs back in case of retaliation. Annie ShieldsTwitterAnnie Shields is the engagement editor at The Nation.